Out in the rural indigenous communities, interviewing people about their health beliefs and practices, it becomes very clear how socially disadvantaged many still are. Mature adults from their 40s upwards are unlikely to have completed more than a basic Primary (First Grade) level of education and many not even this, having attended school for two or three years before leaving to go out to work to help their family. Several respondents had never ever been to school and were functionally illiterate to the extent they were unable even to sign their names. To people from modern developed westernised cultures, this is (and properly so) shocking. Lack of basic education effectively cuts a person out of any meaningful participation in society except its most basic level. 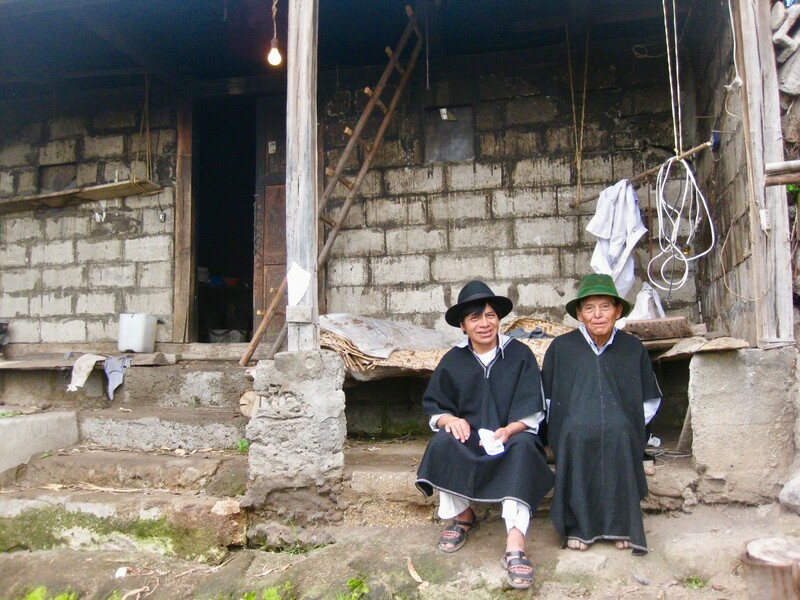 Although the provision of primary and secondary education is now mandatory in Ecuador, the teaching of the indigenous language Kichwa in community schools is still erratic. Until recently it was never taught anywhere and because of this, all respondents felt unable to read or write in their native language, and lacked any confidence in reading the project description or the Informed Consent document, except in Spanish. Furthermore, there is no attempt to frame lessons around indigenous culture, folk traditions or history. Classes in schools focus upon the political history of Ecuador, so indigenous people learn about the 18th and 19th century wars of Independence with Spain, for example, and the well-known names of the nation’s heroes and liberators– Simon Bolivar, Mariscal Sucre – and there is nothing whatever taught them about their own traditions. History is indeed written by the victors. Many know that before the arrival of the Spanish they had been conquered by the Incas; some, like the Salasaka, have an idea that they may have been ‘mitimaes’ – people translocated by the Incas from a different part of the Inca Empire, but this is all. And indeed what sort of history do you teach a vanquished people who, across long centuries, served as humble peons on the vast landed estates of the country’s white elites, or as bonded labourers in the sweat shops of the erstwhile Kingdom of Quito? In many places now however, there is a sense of a resurgence in indigenous ‘pride’ and the evolution of indigenous culture in a way that melds it with modern culture. A fusion; a way forward. 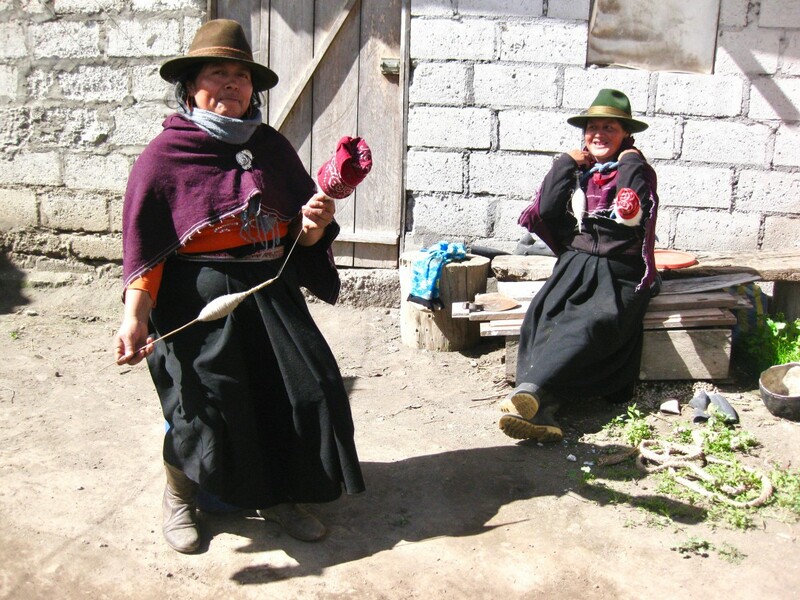 Little by little many people are becoming more economically affluent, such as the Otavalo and some of the Salasaka. But many of the folk I have visited in their homes and fields still live very simple lives with few of the basic provisions that we in the ‘West’ take as basic needs, such as running water and sanitation inside the house. 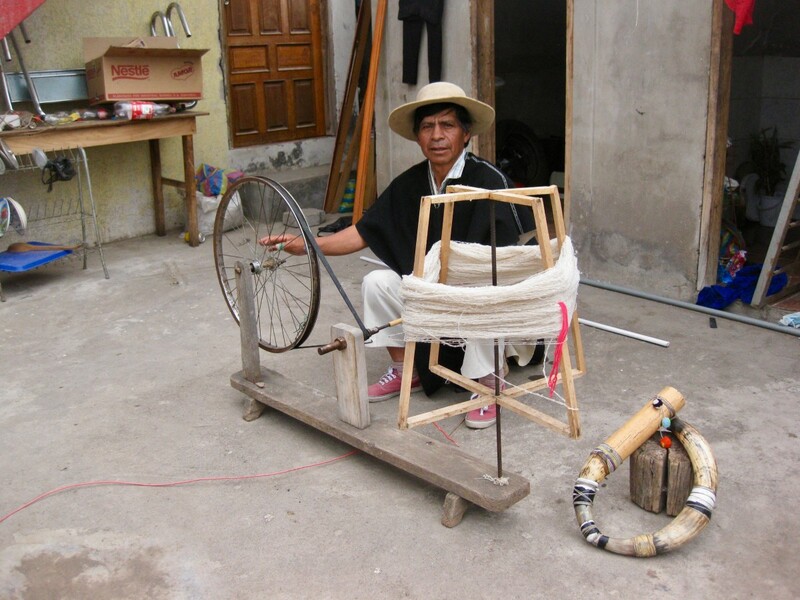 Many of the cottage industries in weaving for example, are still carried out at the manual level, with women spinning yarn from the raw sheep’s wool and men yarn winding and weaving on the big wooden handmade looms. It is fascinating to observe this traditional technology at a level which has long been superseded in modern westernised societies by mechanisation. This is life as it used to be pre Industrial Revolution. 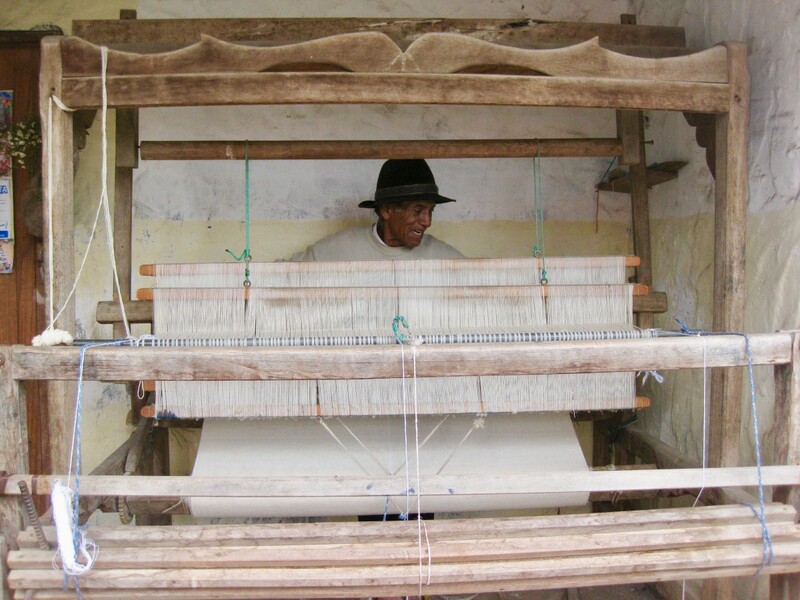 Nevertheless, it serves as a significant attraction in the country’s burgeoning tourism industry, where visitors can enjoy the spectacle of spinners and weavers from a by gone era and purchase beautiful handicrafts to take back to their country as souvenirs and gifts, thus contributing important foreign income to the local economy.